Explore the catalog by scrolling through the courses on each page or by filtering by topic, price, credit type, or credit amount. Your purchased courses will appear in your APA Learn dashboard. Try out APA Learn for FREE with this complimentary course! Experience all the new features of the platform while taking the course and, if you’re an AICP member, even seamlessly log CM. Experience the best of NPC with this curated collection of the most popular sessions at NPC17 and NPC18. These sought-after courses received favorable evaluations, saw high attendance onsite at NPC, or were among the most frequently-purchased or -accessed sessions immediately after being published online. With your purchase of this collection you’ll have the opportunity to earn up to 9.25 CM credits – including 1.5 law credits and 1.5 ethics credits! The APA 2018 Policy and Advocacy Conference Collection includes 5 courses on topics such as Federal Resiliency and Hazard Policy, New Policy Frontiers for AVs and Smart Cities, and Planning Home courses on Funding and Inclusive Growth, Local Innovation and State Housing Reform. Watch the courses at your leisure and earn up to 4.25 CM credits with this collection. 2016 Policy and Advocacy Conference Collection includes 9 exciting expert lead sessions spanning education topics such as Smart Cities, Equity and Placemaking, Fair Housing, Health and Aging Advocacy, Infrastructure Funding, Land Use Law, etc. Watch the courses at your leisure and earn up to 8 CM credits with this collection. Many communities support production of affordable housing in concept but want to balance that production with preserving community character. In this course learn from two combined NPC sessions on the topic of Affordable Housing. Explore tools public-sector planners can use to encourage affordable housing while affirmatively furthering fair housing. Listen as the panelists discuss approaches to developing affordable housing in areas of opportunity. With a majority of US residents expressing a preference to live in walkable, bikeable urban places, cities are struggling to equitably meet the need for urban growth. Learn how cities can reap the full value of transit by transforming their streets into places for people. Hear from experts about the Vision Zero policy for reducing traffic deaths and how it can help you achieve a safe, sustainable, and complete streets in your community. This course combines two NPC sessions to create a topical collection that addresses designing safe and comfortable streets for all users. Planners are playing an increasingly important role in the development of sustainable places and smart cities. This combined course featuring two NPC sessions explores automated vehicle technology, the use of ropeways and gondolas in an urban environment, and the proliferation of e-bikes worldwide. Gain a better understanding of the implications of new technology such as ride sharing, smart utilities, and net-zero design on our built environment. Take your Planning Officials and Commissioners to the next level with this three-part training course collection. Listen in as four seasoned planners share insights from new research as well as sage wisdom gained from countless hours of running public meetings. Parks have the power to reinvigorate urban spaces. This course features two NPC session combined to explore several high-profile parks planning projects and gain insight into how they helped cities creatively foster resilience, equity, connectivity, and economic development. Hear from several representatives from across the country including NYC, Raleigh, N.C., Chicago, IL, Pittsburgh, PA and Dallas, TX as they discuss the projects and lessons learned. Presented in partnership with The Lincoln Institute of Land Policy. This three-part course will introduce you to Scenario Planning, a fully-featured planning process that will allow you to create dynamically responsive plans that can react to unexpected changes. Add 3D to your planning toolkit with ease using today's 3D GIS technology. This course explores the application of 3D for data visualization, long-range planning, evaluating development proposals, and winning support for catalytic projects with realistic development concepts. Planners can inspire community building and support economic development while preserving heritage. Hear how this is being done in places with strong cultural roots as well as the role of United Nations Sustainable Development Goals. Wildfires are on the rise, and planners are learning new roles to help address resiliency. Learn how you can team with emergency professionals to prepare your community through comprehensive plans, development, and building codes. Latino communities often take community development into their own hands with active placemaking often referred to as "Latino urbanism." Learn how to tap into this energy to activate and engage Latinos in planning processes. Examine the extraordinary housing affordability barriers in seasonal-vacation communities: from fair housing for seasonal employees to jobs-housing balance for year-round workers. Case studies focus on New England resort areas, placed in the context of national trends and innovations. New Orleans and New York City are working to harness grassroots policy activism and mandatory inclusionary zoning to chip away at affordable-housing shortages. Explore how governments have interfaced with community-led affordability plans in each city. Philadelphia and Detroit are working to balance the need for stormwater investments with affordability for ratepayers. Learn how planners are leveraging green stormwater-infrastructure practices and incentives to help property owners reduce their bills, enhance neighborhoods, and meet environmental mandates. An emerging planning paradigm — anticipatory governance — is being used address issues of high uncertainty, discarding “predict and plan” in favor of “anticipate and adapt.” Case examples for public policy are presented. This course highlights key findings from original research, focusing on how the design of place can help rebuild trust, revitalize neighborhoods, and support interaction among diverse groups. Sidewalk networks provide access to transit, increase transportation equity, help control air pollution and traffic congestion, and improve quality of life. Learn how Austin's sidewalk and Safe Routes to School programs use GIS tools for analysis, planning, and project management. This course investigates the effects of automated vehicles on land use, physical city design, urban densification or sprawl, and local vitality and activity. This course addresses future public-policy needs of different urban areas (core and inner and outer suburbs) and the implications for planning, design, and policy for automated vehicles and the built environment. Suburbs are not destined to be defined by strip malls with excessive parking and many are reinventing themselves into walkable communities. 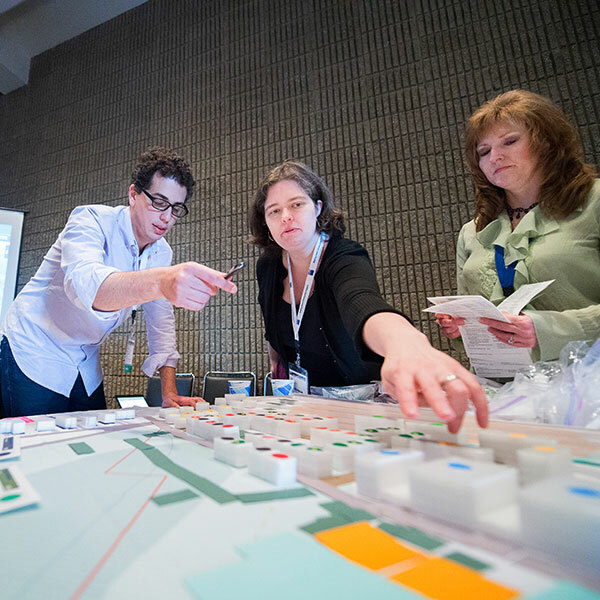 Examine case studies and join a group discussion about how best to adapt sprawling areas into walkable mixed-use places. The newest trend in the hipster revolution of our cities is artisanal food production. Learn how cities around the country are addressing this new use. What does this new use mean for planners, and how can these food producers best be regulated? Are you tired of your comprehensive plan sitting on the shelf and gathering dust? This course provides planning case studies and best practices from communities that have taken on the challenge of implementing their plans.